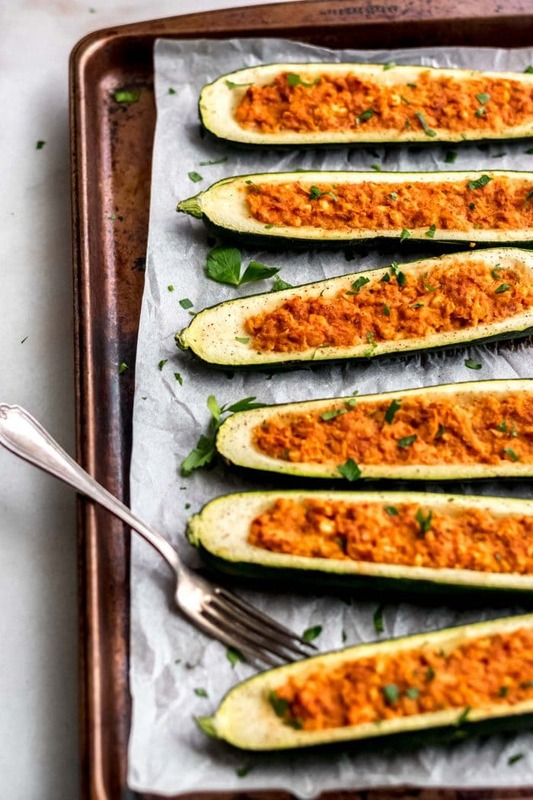 These chickpea stuffed zucchini boats require just 4 ingredients! This recipe is vegan, gluten-free, easy to make and tastes amazing. 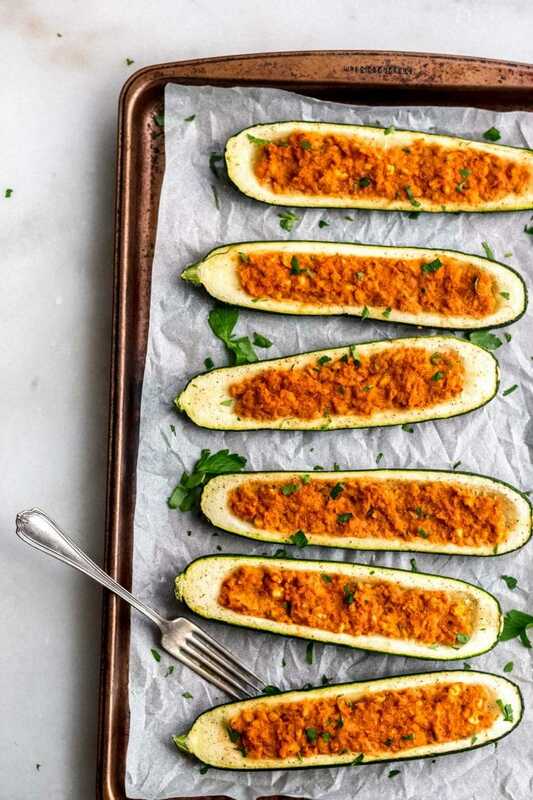 Let’s take a quick look at how to make these easy peasy zucchini boats. First of all, you only need 4 ingredients, so that’s awesome! Zucchini. You want some medium-sized zucchinis, big enough to chop in half and scoop out the seeds. Chickpeas. I used canned chickpeas since I was cooking from my pantry but you can use your own cooked chickpeas if you like. You’ll need about 3 cups. Pasta sauce. Any tomato-based pasta sauce works. I used a store-bought tomato basil pasta sauce. Nutritional yeast. 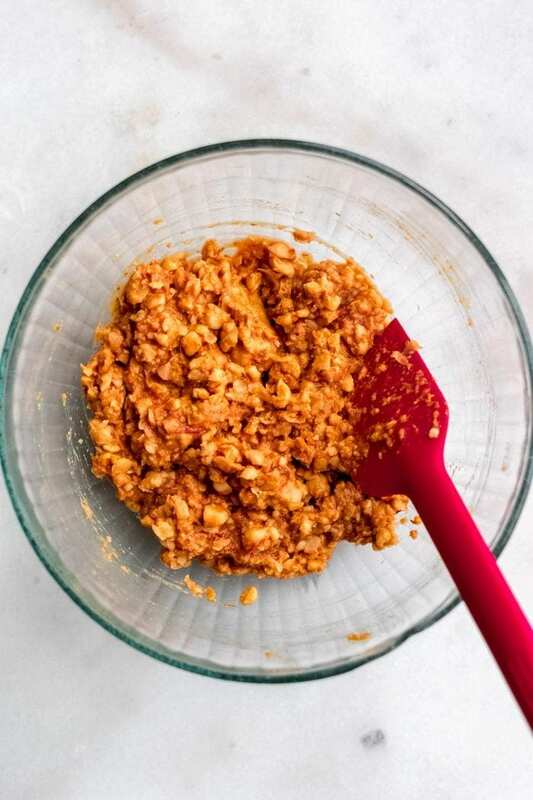 Nutritional yeast adds a cheesy, nutty flavour to the mix. I can’t recommended a substitute for it in this recipe since it’s a key ingredient. So, get your ingredients ready, scoop out the zucchini seeds. 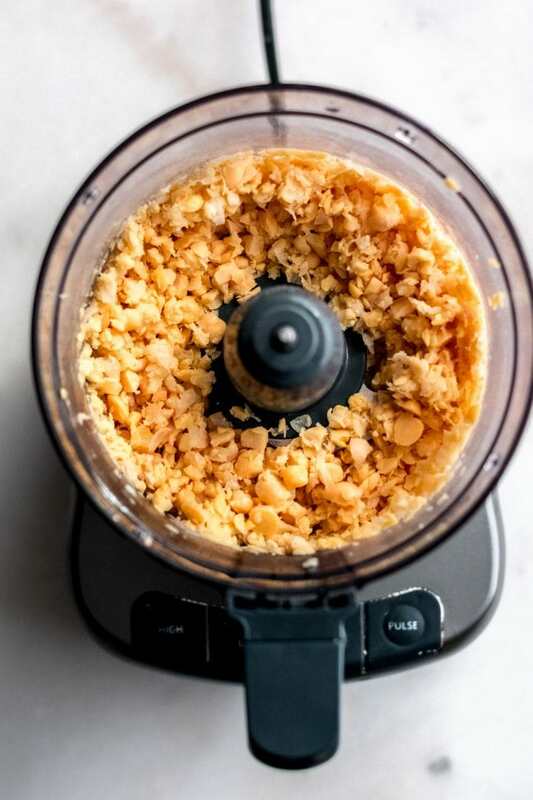 Blend up the chickpeas in a food processor then mix with the sauce and nutritional yeast, stuff it into the boats, bake and enjoy! Here’s where having a well-stocked vegan pantry comes in handy. 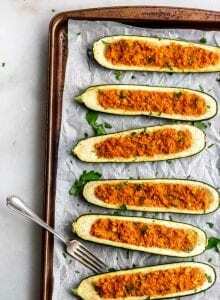 With canned chickpeas, nutritional yeast and tomato basil pasta sauce in the pantry plus a fridge full of fresh zucchini (I always have zucchini on my grocery list), these chickpea stuffed zucchini boats were born! How easy are these?! Just 4 ingredients! I was pleasantly surprised by how yummy these turned out for being so simple. The ever-so-slightly sweet, baked zucchini pairs perfectly with the hearty, cheesy, tomato chickpea filling. You can eat them with your hands for a convenient snack or meal or sit down and enjoy them with a knife and fork. They can be eaten as an entree or a side to another dish. These babies are healthy, high in fibre, vitamins and minerals, low in fat, high in protein and taste amazing! And at just 120 calories per zucchini boat you can go ahead and dig in. 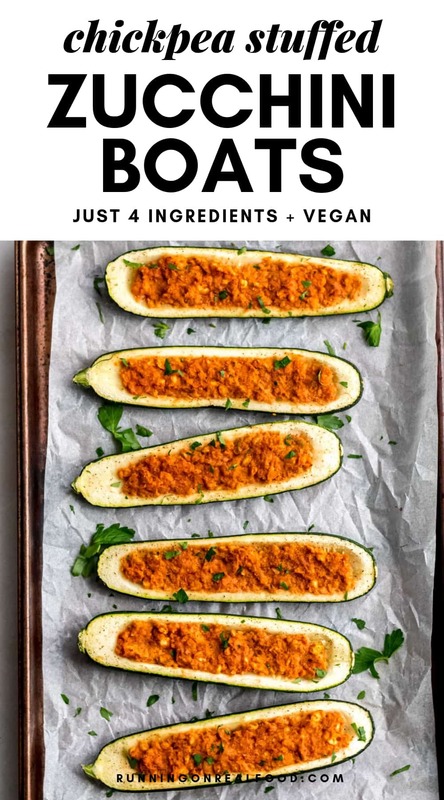 Each zucchini boat provides 19 grams of naturally energizing carbohydrates with under 2 grams of fat and close to 8 grams of plant-based protein. They have almost 6 grams of fibre each and are a good source of vitamin C, vitamin A and iron. 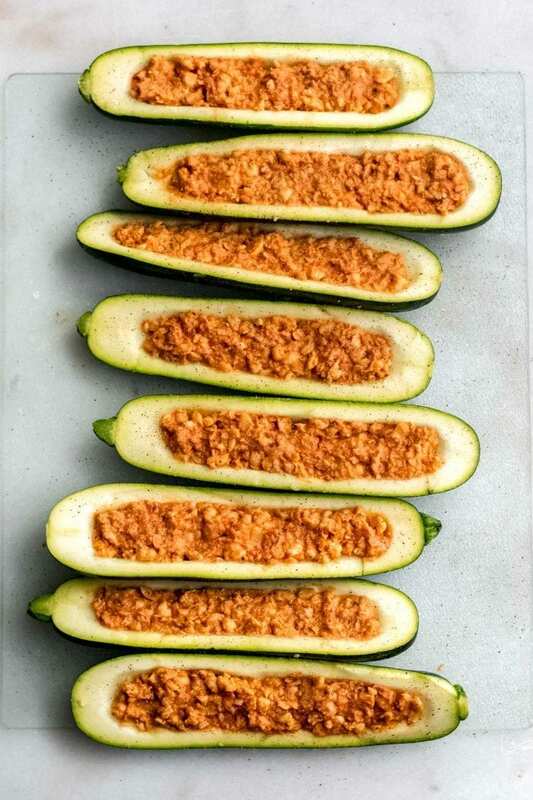 All you need is 4 simple ingredients to make this easy stuffed zucchini! Enjoy on their own, as a side or as a topping to a big salad. 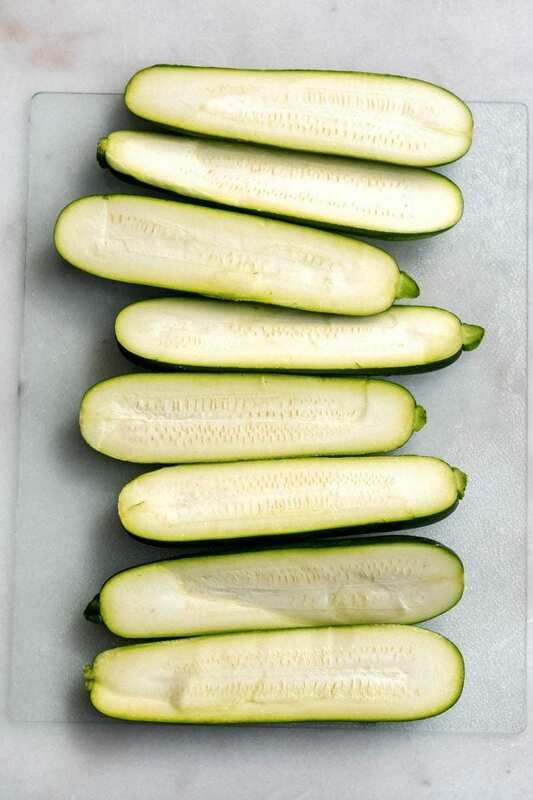 Place the cut zucchinis on a baking pan. 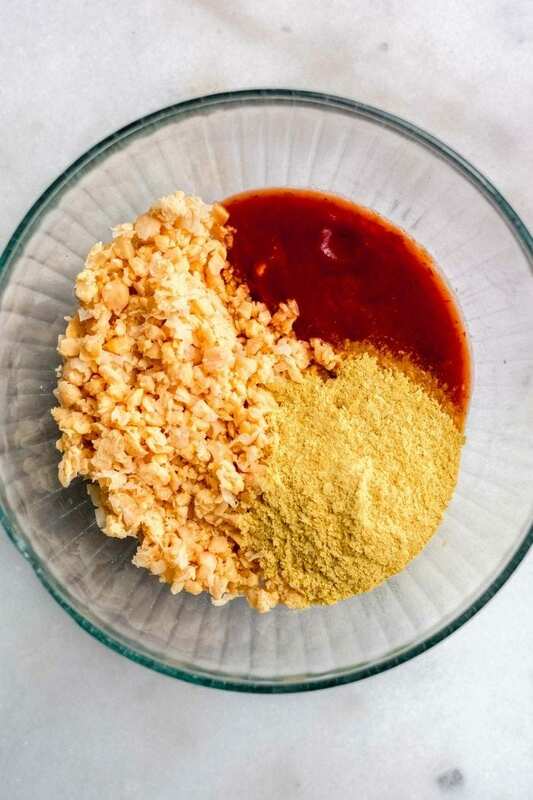 Place in a bowl and mix in the sauce and nutritional yeast. Divide the mixture amongst the 8 hollowed-out zucchinis. Sprinkle with a little sea salt and black pepper. 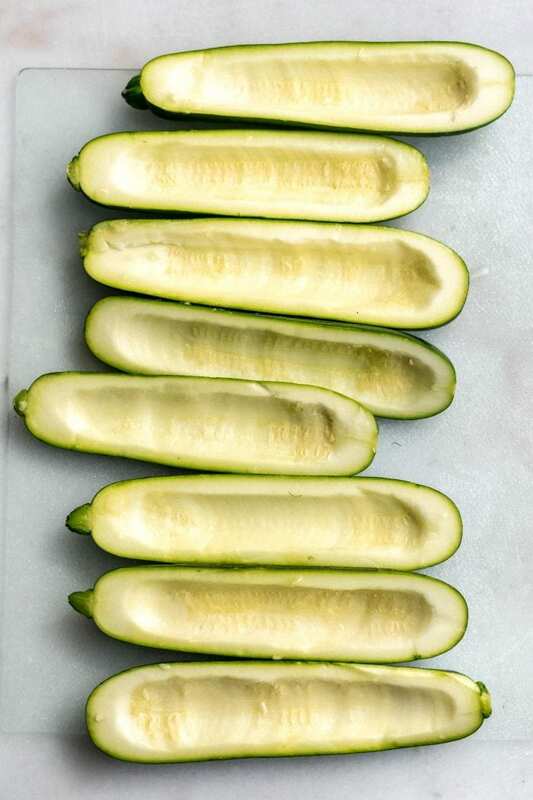 Bake for 20-25 minutes until the zucchinis are tender and the mixture is browned. This looks simple and delicious! Can’t wait to try this one! Thanks! They’re great! Let me know if you try them. Hope you enjoy! What a great idea! Definitely will have to try this recipe! Thanks for sharing! A great idea. Made them, and they will be on a regular weekly rotation when zucchini is in season. The possibilities are endless. 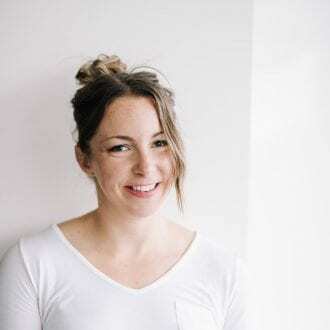 ie: different fillings and seasonings…..Thanks a bunch, Deryn! Happy you liked them 🙂 Totally, they’re super versatile and you can stuff anything in there! Let me know what you come up with. We had these tonight – thet were fantastic! I blended the zucchini flesh with the chick pea mix to have a bit more veg. I also added some green olives. So good. Thanks for another great recipe. Can we make this without adding yeast? You could, it just won’t have the same cheesy flavour. I’d use a bit less sauce as well because it won’t be as thick without the nutritional yeast. Enjoy! So. Good!!! I was amazed at the flavor for such a simple, minimal ingredient recipe. I will make this again and again. I also love that it is so versatile. I added chopped mushrooms and red onions and this recipe turned out great! Did well with med-large zucchinis from my garden. Thanks for the recipe! These look amazing. My husband would love these. Thanks for the recipe. OMG this looks and sounds so delicious! I love zucchini and chick peas, I’m going to have to try to make this! Oh these look so delicious! Zucchini is so in season right now and you can find great ones! Oooh! Pinning this for later! These look delicious! I am normally not one who likes zucchini all that much. But, I have learned to like it if it is cooked a certain way. I love it shredded like noodles, or baked to get a little crisp. I just do NOT like it roasted, it just gets so mushy and not my favorite. But, this recipe looks like it would be really good and I will be trying it out soon. Wow! Can’t believe something that looks this good is made with just four ingredients! I am definitely trying this for breakfast tomorrow.